Increase your business exposure by advertising with the only locally owned regional wedding magazine in Virginia. 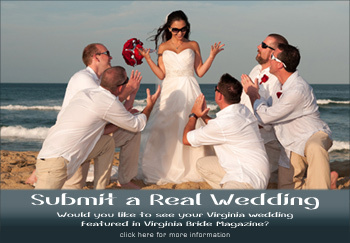 Since 2002, our family owned business, Virginia Bride Magazine has been helping vendors connect with Virginia Brides. Our affordable advertising packages include the powerful mix of print, online and social media all for one price, and reaches brides in all areas of Virginia. The Greater Virginia Bridal Shows, produced by Virginia Bride, are the leading and most respected bridal shows in Virginia. Contact us today either by phone- 804-822-1768 or email- publisher@vabridemagazine.com to find out how we can help your business grow. We look forward to adding your success story to the hundreds of reviews we have online.